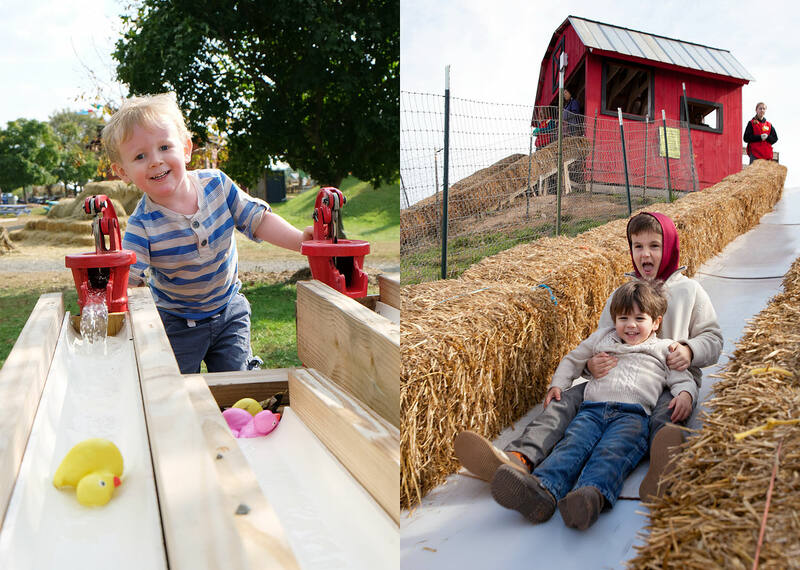 If you have young children, you can’t miss the Cox Farms Fall Festival. It’s 90 acres of sheer silliness. 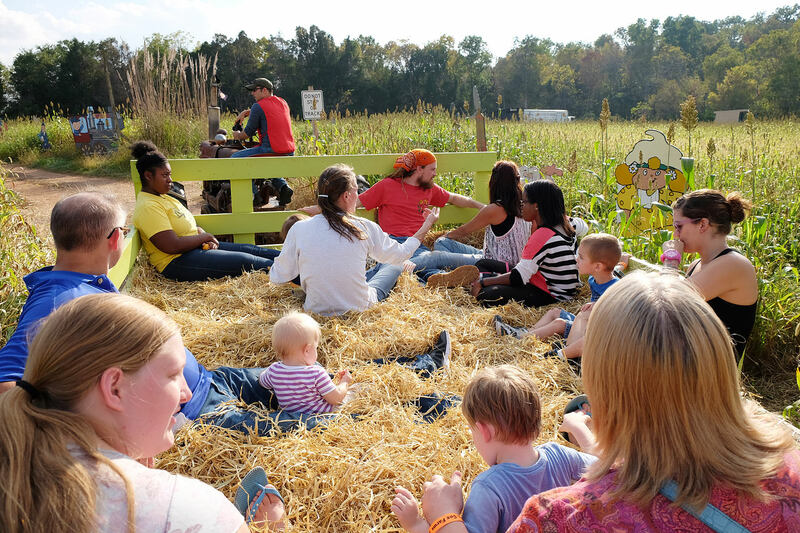 This fall festival is one of the largest and most well known in Virginia, and has been listed by USA Today as one of the coolest pumpkin patches in the country. 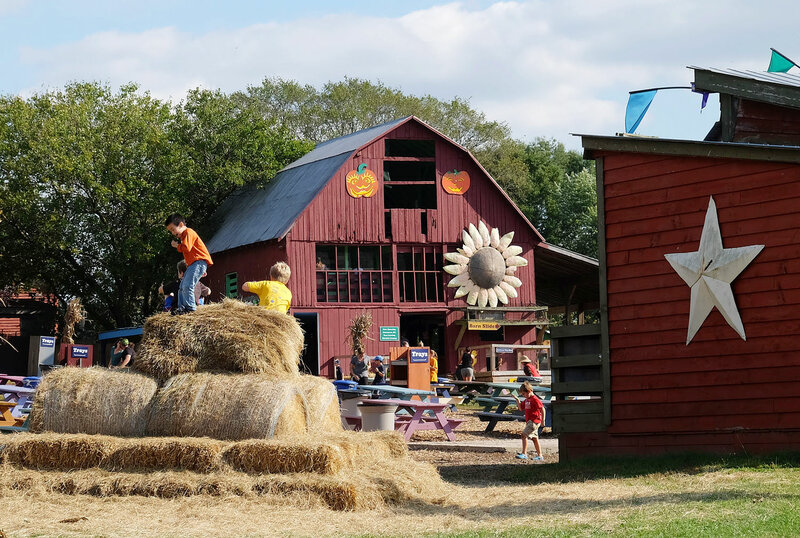 Cox Farms is a family farm in Centreville that transforms into an enormous playground every autumn. The fall festivities began in 1979 as a simple hayride for customers to pick pumpkins in a field. Over the following decades, the festival has grown into a massive production that includes children’s activities, live entertainment, giant hill slides, mazes, and lots of unexpected zaniness. It’s intended for kids 12 and under, but it’s a ton of fun for parents, too. Because the Cox Farms Fall Festival is a must-see annual tradition, it’s huge and often crowded. Even if you’ve been there several times, you may not know some of the best tips to navigate the farm and get the most for your time and money. Here are some tips for your next visit. 1. Visit when the festival is least crowded. The festival has the fewest visitors on weekday afternoons. The weekends that are least crowded are in September and November. The festival continues through the first week of November, so you can avoid crowds by visiting after Halloween. If you visit on one of their peak October weekends, try to arrive soon after they open at 10am, or even a few minutes before that, to be first into the festival. Then head straight to your favorite attraction to avoid lines. 2. Take advantage of the festival’s discount options. Discount Weekdays: Admission is only $5 on Mondays, Tuesdays, and Wednesdays early in the fall season. Last Call: Visit on weekday afternoons after 4pm, when admission is only $5. Public Servant Weekends: Government employees, educators, firefighters, EMS/EMT, police, nurses, hospital workers, and active or retired military receive discounts on certain dates. Senior Tuesdays: Visitors over the age of 60 receive free admission on Tuesday afternoons. Value Card: If you visit frequently, buy a Value Card to get 7 visits for the cost of 5. 3. Buy tickets online to avoid lines. If you plan to visit on a day that is likely to be busy, you can order tickets online and skip the ticketbooth lines. There are no additional fees or surcharges for advanced ticket purchases. 4. Dress in layers and long pants. Even if the day starts out overcast and chilly, you may find yourself under a warm, sunny sky by noon. Weather changes rapidly in Virginia in the fall. Wear a short-sleeved shirt under a warmer layer in case the temperature rises during the day. Unless the weather is expected to be very warm, I recommend long pants for young visitors. 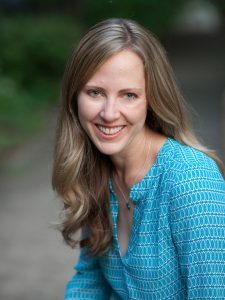 They are likely to spend a lot of time climbing in hay, sliding down hills, and digging in corn, so pants are likely to be more comfortable for them than shorts or skirts. 5. Avoid traffic jams by using their “secret entrance” on Pleasant Valley Road. If the entrance on Braddock Road is backed up, look out for this second entrance into the parking lot. 6. Be sure to try the hay ride. Even if you aren’t particularly interested in hay rides at other festivals, give this one a try. 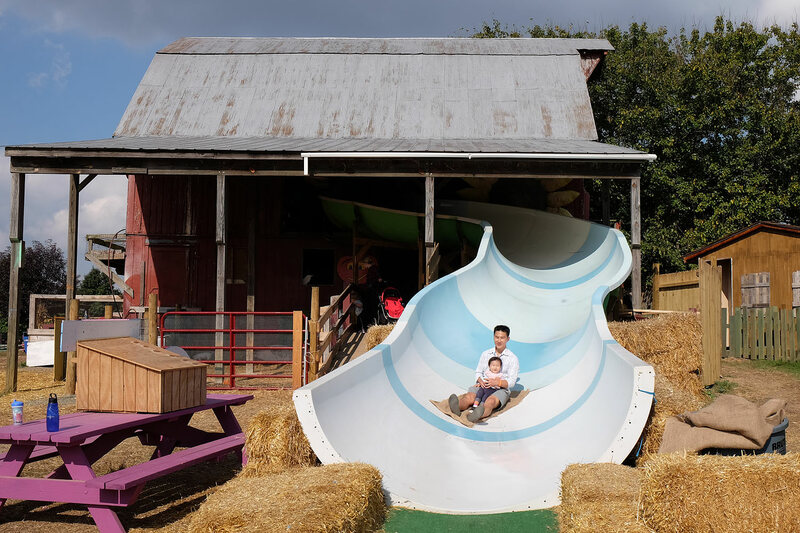 Cox Farms takes a particularly silly approach to their ride, and even adults will get a laugh out of the random sights along the way. In addition to the expected cornfields, Halloween decorations, and farm equipment, you’ll also encounter recently landed aliens, a gnome vs. zombie football game, a stubborn troll, and a party barn, among many other things. 7. Don’t miss the Imaginature trail, new in 2015. This new nature trail is tucked away behind the giant Dinoslide, so it’s easy to miss it. It’s a walk through the woods, with several fun sights along the way, including the cottage of the Three Bears, a gnome village, a musical house, and a party room from Alice and Wonderland. Also included are several educational signs to help visitors learn about the plants they can discover along the trail. To find the Imaginature Trail, look for the sign that says “The Forest,” located to the left of the Dinoslide. 8. Don’t worry about getting lost in the corn maze. The Cornundrum Cornfield Adventure is techically a corn path, rather than a maze. There’s one way in and one way out (except for emergency exits, of course), so you can’t get lost in there. But in Cox Farms style, you’ll encounter lots of unexpected fun sights as you walk along the path. It takes about 15 minutes to walk through Cornundrum, and you and the kids will enjoy discovering what lies around each corner. It’s not a scary attraction, but there was one feature of the Egyptian pyramid that startled my kids and gave me a good laugh. 9. Don’t miss the apple, cider, and pumpkin that are included in the cost of your admission. Apples and cider are available near the castle slide, for no additional charge. Just help yourself. As you exit the festival, each visitor can choose one of the small pumpkins on display to take home. Sometimes you can even select an acorn squash instead. 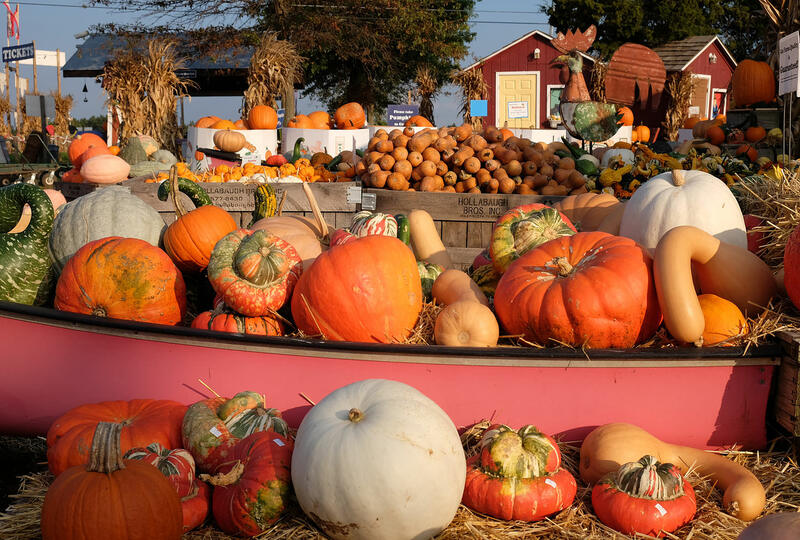 A huge variety of larger pumpkins and other items are available for sale at the market as you exit. 10. Make use of the Family Rest Stop if you have babies or toddlers. A large nursing and diaper change area is available just past the barn, near the Kiddie Zone. 11. Don’t sit on the sidelines. 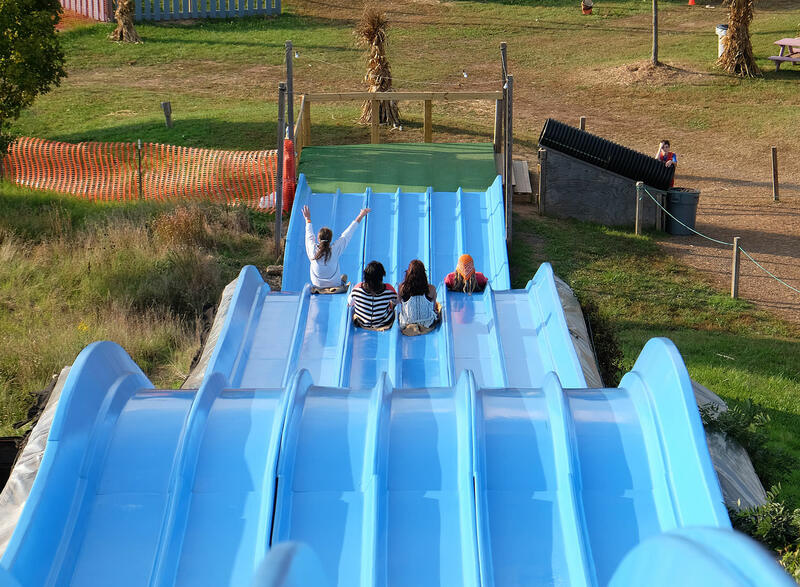 Don’t just stand there and take pictures — go down the slides! Adults love them, too. Go ahead and let yourself be a kid again. 12. Come back at nighttime with teenagers and adults for the Fields of Fear. 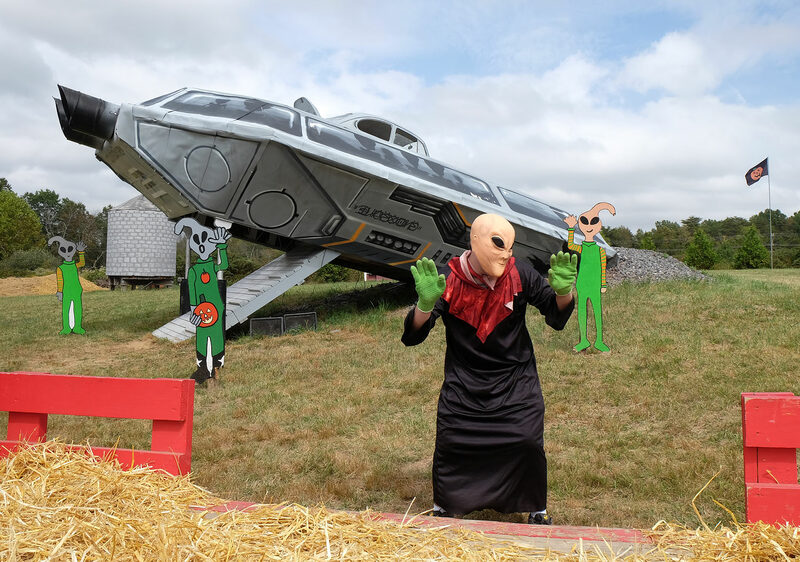 If your kids have outgrown the Fall Festival, or if you are looking for a fun outing for a group of adult friends, check out the Cox Farms Fields of Fear. This Halloween scare-fest is intended for visitors over the age of 12. At night, the corn maze transforms into a frightening CorNightmare, and the hay ride becomes a tour through a zombie zoo. Other attractions include bonfires, dance parties, pumpkin slingshots, slides, and other entertainment. Cox Farms is located at 15621 Braddock Rd, Centreville, VA. 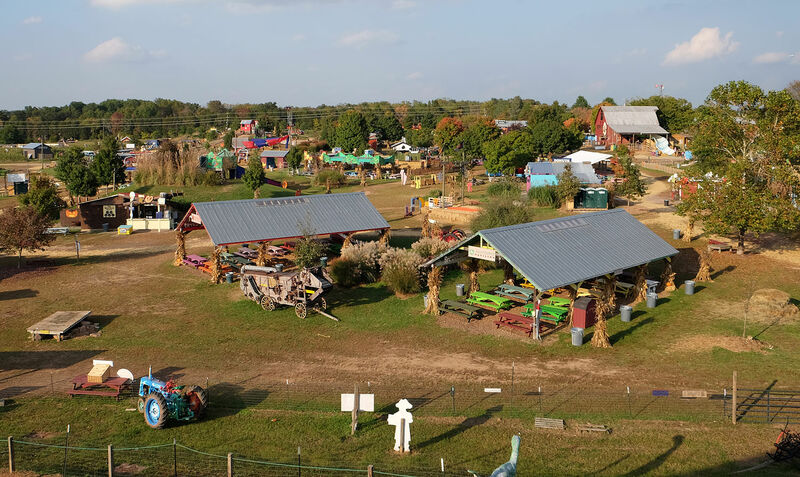 The Cox Farms Fall Festival takes place every year from late September through early November, and it is open daily from 10am-6pm. For more preparation tips, you can print out a checklist provided by Cox Farms. They also provide a PDF map of the festival, for you to print and bring with you.